Heading out the door for a walk in the fresh air is a favourite activity for babies and parents alike. Many parents begin walking their babies early on and need a pram or stroller that offers proper support and comfort for newborn babies. Fortunately, stores are jam packed with a broad selection, so although finding an acceptable choice shouldn't be a problem, deciding which one to take home may be mind boggling! Prams, the most traditional baby travel option, have made a big comeback in recent years. Once the natural choice for most families, prams declined in popularity for a number of years, only to return to top baby shower wish lists once again. They are especially nice for young babies since they allow parents and other caregivers to lay the baby in a fully reclined position, which is not always available in other types of strollers. Additionally, prams offer a shield from the sun and wind, making them friendly in many weather conditions. While traditional prams of the past were designed for use with babies up to about 4-5 months old, today's top of the line prams can stroll your baby in style and comfort from newborn through the toddler years. Most prams are more costly than strollers, but by first adjusting the backrest continually more upright as baby matures and then substituting a stroller type seat for the bassinet once baby is ready for fully upright strolling, many parents find that they get plenty of use from a pram to justify the additional cost. Strollers have come a long way in recent years, now offering an assortment of models that are ideal for even the youngest babies. Unlike the strollers of a generation ago, many of today's choices offer sufficient head and neck support for newborns. Strollers that are part of travel systems are likely the most popular choices for new babies since they offer the convenience of combining a car seat and a stroller. 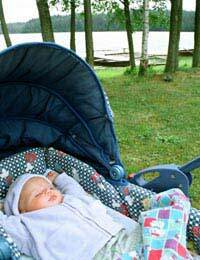 Travel systems allow you to transfer your baby, still settled into the seat, from stroller base to car seat base with ease, a huge benefit when trying not to disturb a sleeping baby. More important than style or price, safety is the biggest factor in determining which pram or stroller is best for babies. While virtually all major manufacturers make every effort to exceed widely accepted safety standards, parents should exercise caution when choosing borrowed or hand-me-down strollers. While most are likely to be perfectly safe, it is a good practice to check to be sure that the stroller you are considering hasn't been recalled. While most prams and strollers are perfectly fine just as they are, many manufacturers are now offering a nice variety of accessories to make family walks even more pleasurable. From snap on bags for storing additional cargo to netting that will protect your baby from insects, the little extras can sometimes help you to decide which stroller is right for you.